which is already formally integrated into sundry college curriculums. Does one sui generis dynamic - Infinite Divine Quest for Potential∞ - drive the Cosmic Order? 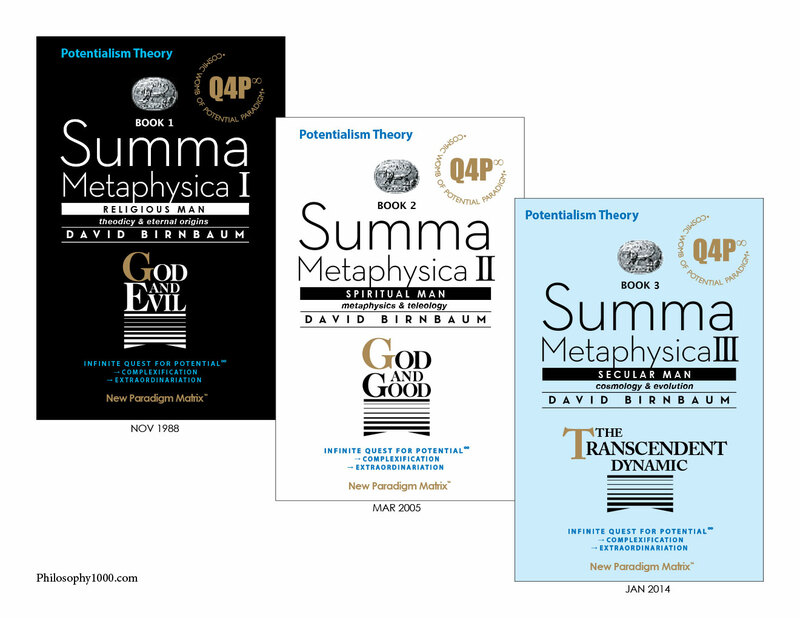 Summa Metaphysica, the 3-volume treatise by David Birnbaum, builds a complete metaphysics around the theme of "Potential". 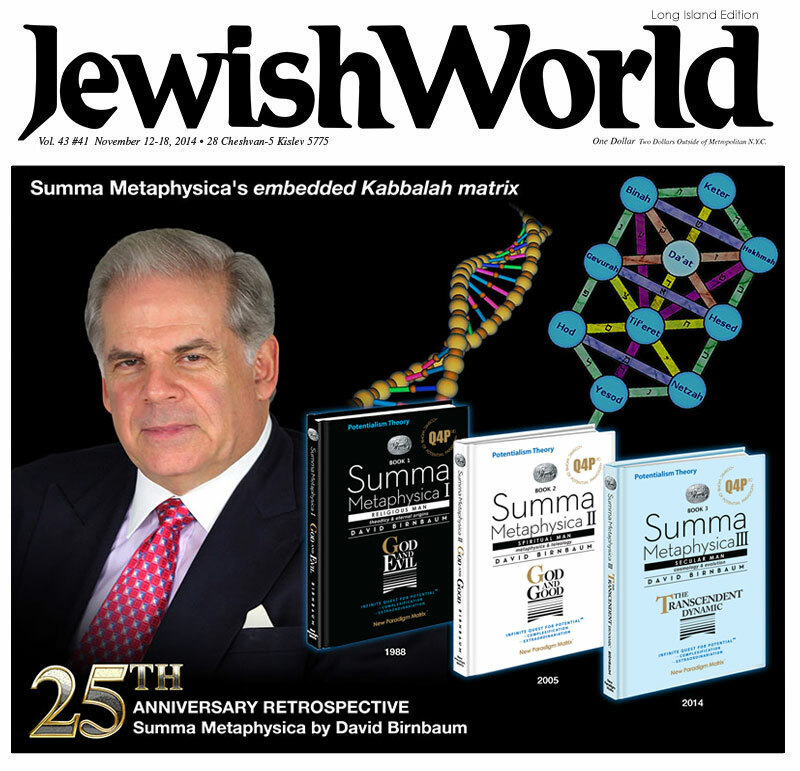 The Jewish World Publication Group just-recently did a Cover Story / 25 Year Retrospective / on the Birnbaum work – focusing on the embedded Kabbalah matrix traversing the series. We hope you will find their presentation of interest. Of course, there have been noteworthy attempts to defy this generalization. Maimonides is perhaps the most prominent example of a Jewish philosopher who would analyze — if not challenge — Judaism’s fundamental suppositions. In his Guide of the Perplexed, Maimonides describes a Judaism that dovetails seamlessly with an understanding of the universe as established primarily by Aristotle. As Maimonides holds Judaism to the light of Aristotle’s logic, he finds concordance on all topics, with merely one exception: the question of eternalism. It is at this juncture that David Birnbaum enters the forum. He does so by delineating the relationship between God and eternity in the context of a unified metaphysics that concurrently addresses the relationship of God to the cosmos and the cosmos to eternity. Asserting that previous attempts to characterize the essence of the cosmos have fallen short for their lack of an adequate conceptual arsenal, as exemplified by Maimonides’ and Aristotle’s impasse, he consolidates these eclectic influences into a defined set of metaphysical “tools.” Birnbaum presents these tools at the outset of God and Good. He then uses them to build a model that is applicable to all the arenas from which its influences were initially derived. Interestingly, in spite of its novelty, the paradigm elaborated by Birnbaum is no less firmly anchored in biblical and Talmudic concepts than the previous Jewish perspectives that were restrained by these same influences. For instance, God’s self-identification as “I will be that which I will be” (Exodus 3:14) is perhaps the single best articulation of God and Good’s description of potentiality’s association with God. In his first work, Birnbaum meticulously dissects Adam’s Garden of Eden dilemma (Genesis 2:17), understanding it as humankind’s choice between potential/infinite growth and bliss/limited growth. Birnbaum then goes on, throughout God and Evil and now God and Good, to reveal the theme of potential in traditional Jewish narratives and even Judaism’s specific commandments. At the outset of God and Evil, Birnbaum boldly asserts that he aims to provide an integrated and novel solution to the problem of: the origins of the cosmos; the nature, as it were, of God; and the presence of gross evil in a world governed by an omnipotent God. At this point, the expectation, at least for this reader, is for a complex, convoluted theory too abstract to be considered objectively. The result, however, a “potentiality model,” is just the opposite: profoundly discrete, yet overarching enough to satisfy the three initial aims. With the presentation of the second book, this model now has four distinct dimensions. First, in God and Evil, it is thoroughly rooted in biblical and academic theology. Second, in part one of God and Good, the metaphysical implications of the model are described. Third, in part two of God and Good, the model is presented in the form of 120 mythical Angels, adding texture to the metaphysics and drawing it into the realm of daily human reality. And finally, in the third section of God and Good, the “potentiality model” is translated into a practical template for self-actualization. It is difficult to recall a metaphysics as unified, yet as widely applicable, as the one presented here. The model’s foundation is concrete, while its implications are personal and thus varied. Each reader, therefore, will glean that which augments his or her own spiritual sensibility. As an Orthodox Jew, I find much in Birnbaum’s two works that bolsters my understanding of traditional Judaism. No less sui generis than the scope of Birnbaum’s work is its relentless appeal to profound innate human understandings that cannot be adequately explicated in standard prose. Birnbaum employs a linguistic ensemble that at times resembles the watertight, nitty-gritty reasoning of God and Evil, while at other times feels like terse jolts to the psyche. The author has turned away from the prevalent style of philosophy that so fervently analyzes metaphysical mysteries only to expose its own limitations. In breaking from convention, Birnbaum has taken a risk. He has gambled acceptance by refusing to succumb to a more traditional framework that would inevitably fail to fully represent the depth of ideas presented here. — traditional explanations do not suffice. Birnbaum posits that the force driving the cosmos pulsates within the soul of each individual, and so only a visceral response from the reader can fully reflect its impact. Is this achieved? Do the grand, general, cosmic principles yield to an understanding of the self? Does this awareness, in and of itself, have meaningful and practical implications for daily life? If it does, then Birnbaum has achieved something utterly unique. He has raised a preciously simple metaphysical centerpiece and enshrined it through its intrinsic affinity for the mind and the heart of the reader. Dr. Daniel Khalil is a scientist with the National Institute of Health. He teaches Jewish Philosophy at Long Island University. “But why did God ‘want/need’ to create the world and people?” I asked Morah Bracha in high school. (God does not “need” anything, as God is complete.) “We don’t know,” she answered. She had replied adroitly to many of my other questions concerning the purpose of life by using her knowledge of Judaism. But at that question she stopped; she had no answer to that question. I continued to wonder. Why would God want, need, desire or care to make a physical world since he does not need us, and gains nothing from us? Why create a world in which humans strive, have freedom of choice and gain merits for the good we accomplish? If I could find an answer it would be a key to the purpose of life and the universe — understanding God himself. I was raised by Polish Jewish parents who were survivors of the Holocaust. I was haunted by the other classic question described as the problem of theodicy. How can one reconcile the all-powerful, all-merciful, omnipotent God with the existence of gross Evil? The “problem of Evil” comes into full focus with the Holocaust. See www.GodAndEvil.com. The above were my two major inquiries. In addition, I tried to find ways to reconcile science and faith. Why didn’t/couldn’t science support faith, and increase faith? Where science was used to disprove faith, I considered that a perversion of the science; I believe that scientific knowledge has been used incorrectly. Over the years I accumulated knowledge relating to the friction between the two areas; I pored through books and articles trying to “prove” faith in God, in every way possible, especially through scientific knowledge. I searched for answers to the above questions until Providence, also known as Hashgacha Pratis, had me pick up in 2012 the profound book God and Evil, published in 1988 by David Birnbaum. for Potential as His ‘core’ and an operating tool and drive. David Birnbaum is under near incessant vitriolic personal attack by a (small but vocal) rabid element of the global “Hard-Line Atheist community”; to hard-line atheists, yeshiva-educated and Harvard-educated Birnbaum is Public Enemy No. 1. Why? Multiple reasons. But the three salient ones are that: Birnbaum delineates direction to the universe; Summa provides nicely laid-out “intellectual space” for the Divine; and Summa dedicates an entire book to resolving theodicy (noted above), hitherto considered the Achilles heel of religion. Before reading Birnbaum’s Potentialism Theory, I attempted to find as many explanations and facts as possible to support faith in God. I felt driven to do so. Birnbaum’s Summa Metaphysica I: Religious man: God and Evil (p. 23) states that “Leaps of faith, by definition, require faith in the leap — because halakhic man is not an emotional acrobat. While Judaism is permeated by the transcendent, it is still a religion of intellectualism, carefully delineated law, carefully grounded in Divine Texts.” So true. Birnbaum’s Summa Metaphysica places Holy Quest for Potential at the core of Hashem; the theory invokes the Self-described name of God at the Burning Bush saga in Shemot: Eheyeh asher Eheyeh — I Will Be That Which I Will Be. Meaning, I Am the God of Potential. The Summa Metaphysica reading of the Divine text is, indeed, riveting. Who better to define God — than God? Per Summa, Holy Quest for Potential (infinitely iterating) both instigates and drives the entire cosmic order; the Protagonist of the cosmic order is a “Holy Quest,” not a classic entity. I was shaken to my very core. A slight pivot — a “Holy Quest,” not a classic entity — and suddenly Judaism as a whole is dramatically more compelling and bulletproof. A pro-science and pro-Jewish philosophy stunningly powerful and original — yet within the bounds of Orthodoxy. 1. The purpose of man is to quest for his potential. 2. The greater man’s freedom, the greater his ability to attain his potential. 3. Freedom requires privacy, responsibility and selfhood. 4. In order to yield man greater freedom (along with the above three factors) God has contracted His here-and-now consciousness, in correlation to mankind’s ascent in knowledge. 5. With the Divine consciousness increasingly contracted from the here–and–now and evil existent in the here–and–now, man is increasingly forced to confront evil on his own. Picturing God has always been a difficulty. His qualities, His desires, why and what He desires — these are all difficult to conceive of, because we know that God, the Creator, He was, He is, and He will be — is a different “element” than mankind He created. Kabbalah speaks of God as Ein Sof — without end or endless, and “ain od milvado” — there is nothing else but God. It required “tzimtzum,” contraction, for an infinite being to create the finite universe. See www.Summametaphysica.com/first-summa-reviews/. We see God’s manifestations and handiwork, but we do not understand or comprehend all of Him. So I see no “stira,” no contradiction, in thinking of God as incorporating the Quest for Potential as His “core” and an operating tool and drive. That same Potentialism quest harnessed the tools of physics and mathematics to ignite the universe during creation. See also www.SummaKabbalah.com. As the article in Broowaha by Vkas Sharma states (Sept. 4, 2014), “Potentialism not only shows a universe of life, future, creation and complexity — it shows a universe of intention. This has been one of the reasons Atheist academia have attacked Potentialism so vehemently. To be clear, Potentialism is ultimate scientific cosmology. It does not guarantee that G-d itself exists — at least not in any way a particular religion expresses and defines him. What Potentialism does do, is open the metaphysical possibility for G-d.” See www.MetaphysicalAnchoring.com. And finally faith requires Choice. Freedom requires choice. Freedom of choice is required by faith. This leads to my final understanding and acceptance of God and what He wanted when He created man. It appears to me that God wanted, desired, needed, enjoyed, was expanded by the concept of creating a universe with creatures that can Choose — Choose to be Good or Choose to be Evil. Choose to grow or choose to atrophy. And this essence is seeking the good (and great) but allows for evil so that we can have freedom to grow to extraordinariation. So now, I seek for ways to emulate and enhance the presence of God — not explain or prove his existence, and the classic theodicy challenge to God, is laid to rest. See https://www.summametaphysica.com/modern-kabbalah/. May the souls of the hallowed Holocaust victims ascend ever upwards and Heavenward. And as for the (extraordinary) Jewish people as a whole, Eheyeh asher Eheyeh ... we advance forward to fulfill our extraordinary and God-given Holy Potential ... forevermore ... Onward. “Shayndee Feldman” (not her real name) is a “Black Hat family” religious mother in Israel. Three-volume Summa Metaphysica (1988, 2005, 2014) by David Birnbaum presents a universal and fully-integrated metaphysics — via 3 lenses- Religious/Spiritual/Secular. See https://www.summametaphysica.com/theory-core/. Summa Theory (aka Potentialism Theory) is a unified-theodicy/theology/ theogony/philosophy/cosmology/ metaphysics/teleology and it competes on the world stage for pre-eminence on that basis. See Unifying1000.com. The “unification” is achieved via just one hypothesized concept: Infinite Quest for Potential. See Glossary1000.com. However, embedded just one layer beneath the pristine metaphysical surface of 3-volume Summa Metaphysica is a powerful and elegant neo-kabbalistic matrix traversing the entire series. See Summametaphysica.com/first-summa-reviews/. Summa I presented a unified metaphysics with a strong kabbalistic underlying motif — as the core underlying metaphysics of the series. As per the title, Summa Metaphysica I: Religious Man: God and Evil, the first volume is presented through a religious lens. See MetaphysicalAnchoring.com. The Summa Metaphysica work has been described as a 21st century Kabbalah. Indeed, a strong case can be made to that effect. See www.Summametaphysica.com/modern-kabbalah/. Summa Metaphysica I: Religious Man: God and Evil (Ktav, 1988) pivots off of Lurianic Kabbalah; Summa draws direct parallels between Isaac Luria’s En Sof (the Lurianic No End primordial Divine) and Summa’s proposed Infinite Quest for Potential∞. See Summametaphysica.com/lurianic1000/. Note that Isaac Luria (1534- 1572), aka the sainted ARI, was a rabbinic/mystic of Safed, Galilee, Palestine. The same Summa volume pivots off of Lurianic tzimtzum (Divine contraction); Summa draws direct parallels between Luria’s tzimtzum, and Summa’s proposed contraction of hereand- now Divine consciousness. Summa II, Section 2: Gods 120 Guardian Angels (i.e. Potentials) is actually pivoting off of (non- Lurianic, albeit) kabbalistic Ten Sefirot (emanations of God through which God reveals Himself). More precisely, the Ten Sefirot are the progenitors of the myriad of Potentials of the universe. Over the course of the 3-volume series, Summa makes the case for a teleology (cosmic purpose/direction). Per Summa, the universe quests after ever-greater advance and elevation. Of course, this parallels the iconic Kabbalistic theme of Tikkun Olam. Tikkun Olam is typically positioned as repairing a flawed universe; Summa would not negate that contemporary interpretation, but would point out that there are other important classic streams in kabbalistic thought fully in-tune with Summa’s thrust of perfecting an incomplete universe. The Summa proposed metaphysical SuperLaw cosmic equation is: Q4P∞ > C+ > E+. En Sof > Eheyeh asher Eheyeh > Sefirot > Tikkun Olam. Meaning, En Sof (No End) seeks-after (biblical) Eheyeh asher Eheyeh (I am the God of Potential) which seeks-after (Lurianic Kabbalistic) Sefirot (Divine emanations, manifestations) which seek-after (Kabbalistic) Tikkun Olam (perfection of the universe). Or, in English only: The No End seeks-after the God of Potential, which seeks-after manifestations of the Divine, which seek-after perfection of the universe. The above construct then simultaneously resolves the following classic hitherto intractable and hitherto unresolved Metaphysical/Cosmological/ Philosophical / Theological Problems/Dilemmas/Issues: [See Simultaneous1000.com]. You started writing Book 1 of Summa Metaphysica in 1982; 32 years later, there are now three distinct volumes: Religious Man (1988), Spiritual Man (2005) and Secular Man (2014). How have you changed as an individual over the course of crafting the three works? So, this is a big question and I will try my best to answer. I started writing Summa I in 1982 at age 32 and now I am 64; so, the latter 50 percent of my life to date has had Summa in the picture; so, indeed, much has transpired. Indeed, the Summa endeavor has bracketed, among other key sagas, the birth and evolvement of my three children, now all young adults in their 20’s, with one grandchild included. I presume that the main effect on me of the neo-academic endeavor has been to expand my consciousness, as I press my little brain to incisively “wrap around” the various focus-subjects du jour. Also remember that when you write, you are compelled to research as well, and one gets stimulation — and mental expansion — from exposure to the thoughts, mental processes and ideas of others. How has your “world view” changed as a consequence of your writing? Initially I thought that in the respective communities — Religious, Spiritual and Scientific — the “power of ideas” aspect carried the day; but I see that the “power of ideas” aspect is necessary but far from sufficient in, so to speak, carrying the day. To get through the palace gates of any of these realms, one will encounter key players who are either threatened “ego-wise” or power-wise by your potential entry; one will encounter gatekeepers who view your presence in their “palace” as not “politically correct” and therefore unacceptable; one will encounter gatekeepers who view your writings as not within the precisely proper “frequency.” Aside from all of the above, in many venues, there can be 1,000-10,000+ submissions for every piece ultimately covered or published. The process is brutal. In sum, all three turfs are extremely “politically correct” and the respective gatekeepers hyper vigilantly enforce this. It is a profound shock to witness this across the- spectrum. So where is the “opening,” so to speak? The potential “opening” tends to be at the very top of each “pyramid” — very top rabbinics, very top spiritualists and very top scientists — where the “pinnacle players” tend to be more into new ideas and concepts; they also tend to be somewhat more adventuresome. And what is the “saving grace” in all of this? A final wild card is the Jesuit community, in particular; from my perch I see the Jesuits — and their global infrastructure of colleges and journals — tracking the world of ideas with care; in contemporary times their respect for Jewish authors demonstrably surpasses that of the Jewish community. Note that these are the same Jesuits who were at the vanguard of Jewish persecution for many centuries. How do you react to this description of your work? I am wary of Kabbalah, in general, and the Zohar, in particular. However, having said that, I believe that Lurianic Kabbalah — and the rabbinic line that carries its torch — does indeed, in its own way, cut to the core of cosmic mystery — even if it is, from my perspective, only sort-of on-the-mark say, 30 percent of the time. But 30 percent is a lot and that 30 percent is, indeed, a great and timeless treasure. Summa pivots on that 30 percent of Lurianic Kabbalah, itself a substream of Kabbalah, itself a substream of Judaism, itself a substream of world thought. But, buried treasure is still treasure. Did you initially set out to embed a Kabbalistic matrix across the span of the 3-volume Summa? I initially set out to crack Theodicy (the classic problem of God and Evil). To do so, I had to first crack the Eternal Origins question — see https://www.potentialismtheory.com/eternal-origins-english/. I hypothesized an eternal metaphysical dynamic — Infinite Quest for Potential — and realized that I could historically tether it with Lurianic En Sof; this proposed En Sof is the primordial divine No End hypothesized by Luria. Thus, my little 3-volume cutting-edge 21st century metaphysics ultimately pivots on an esoteric concept from a 16th century mystical construct. In the past 14 months alone, more than 80 articles have appeared which focus on your theory; do you possibly have a favorite? Actually, I particularly like the relatively short piece — “Birnbaum’s Beethoven or Darwin’s Beethoven?” [see Beethoven1000.com]. It makes the case lucidly and directly — and in a grasp-able manner. Rabbi Marvin Tokayer, former spiritual leader of Japan’s Jewish community, is a prolific author in both English and Japanese, a contributor to the Encyclopaedia Judaica and former rabbi of Great Neck’s Cherry Lane Minyan. His latest book is Pepper, Silk & Ivory: Amazing Stories about Jews and the Far East. Tackling the question of Theodicy, reconciling belief in a just and loving God with the existence of evil, is not for the timid. But this is the task that David Birnbaum has taken upon himself. And tackle it he has, with open eyes and with his gloves off. The result, God and Evil, is an extraordinary work, a tour de force, in which he carefully analyzes the question and arrives at a fascinating and penetrating conclusion. While one may not agree with every aspect of his presentation, no one could question his brilliance or clarity of vision. And many, I am convinced, will find his conclusions satisfying, and, in important ways, comforting. To summarize this complex thesis in a few sentences: God, even a just and loving God, was “obligated” to allow for the existence of evil in order to give man the opportunity to reach his full potential. During the early stages of Man’s development, when his intellectual and cultural progress was still primitive, God intervened in decisive and explicit ways. However, once Man had developed further, God allowed him increased responsibility to make his own choices, withdrawing His involvement in order to encourage Man’s spiritual and cultural growth. Just as a parent leads a young child by the hand when he is beginning to learn to walk, and then gives him increased independence when the child has grown and is able to cope with that freedom, so, too, God gives Man increasing opportunity to make his own choices. If the parent does not withdraw his influence, the child may remain safe but will never develop his full potential. The same is true for mankind; growth as a species requires the opportunity to make mistakes. With this choice Man has indeed grown in many wondrous ways. But history, especially modern history, is replete with unspeakable horrors. 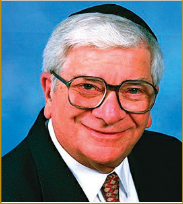 Birnbaum focuses especially on the Holocaust, perhaps the greatest example of deliberate and pervasive evil and brutality (and, I gather, a powerful force in Birnbaum’s personal and family history — he dedicates the book to members of the Birnbaum family who were martyred in the Holocaust). The Holocaust, he writes, is an example, albeit a terrible one, of Man’s misuse of his freedom. This, however, does not change the terms of the bargain — Man has been given freedom, the divine Parent has agreed to allow the child to find his own way. Sometimes the consequences will be terrible but it is all part of the horrible and wonderful deal Man has made with his Creator. There is certainly room to argue with this thesis. For one thing it is predicated on the assumption that freedom requires God’s withdrawal. It assumes, for example, that allowing for a God who intervenes in response to prayer, while at the same time accepting that God remains withdrawn in order to give man freedom, creates an intolerable paradox. While Birnbaum’s solution is certainly elegant, not every reader may require it. I am not a philosopher or a theologian, but to me the notion of contradiction and paradox when dealing with the Divine is not at all intolerable. Paradox is a reality of our existence. We encounter unavoidable paradox, for example, in the fundamental questions of Quantum Mechanics, namely, how can a photon be simultaneously a wave and a particle, and how can it occupy two points in space simultaneously depending on how we observe it? Though we can not explain these paradoxes we have come to accept them, and, as in the case of information technology, learned how to benefit from them. If paradox is inescapable when studying the characteristics and behavior of a photon, then why not when contemplating the Master of the Universe, whose very existence and nature we assume to be beyond our ability to comprehend? There are, of course, other solutions to the problem of Theodicy, as Birnbaum demonstrates in his comprehensive and excellent review of the topic in the early chapters of this work. Each has its own limitations (including, of course, the one I alluded to above). But the existence of these alternative solutions does not detract from the one Birnbaum proposes. So, the essential question is: If one is not satisfied by those other answers to the question of how a good and loving God could exist in a world filled with evil, if one is troubled by the question and hungry for an answer, does God and Evil provide that answer? It is not for me to say if Birnbaum’s hypothesis/solution gives “the answer,” but the one it proposes is certainly brilliant, lucidly presented, compelling and, in many ways, very satisfying. There is certainly reassurance to be found in the notion that the terrible consequences of our freedom are inextricably tied to our very nature as God’s children, and to the opportunity for spiritual growth and closeness to Him that He has provided for us. By LAWRENCE H. SCHIFFMANThe issue of “theodicy,” the theological attempt to justify the existence of evil in a world created by a good God, has plagued humanity from time immemorial. Greco-Roman paganism attempted to solve this problem by positing separate gods of good and evil. In the early centuries of our era, Gnostic Christians tried to distinguish two gods even in the Torah’s creation stories. Eastern religions and Zoroastrianism also adopted such dualistic solutions. Judaism could not and did not seek solutions to this problem that would compromise its monotheistic stance. For this reason, with every tragedy in Jewish history — and there were many indeed — our people were faced with the philosophical challenge of explaining the existence of evil in the world. Jewish philosophers and mystics responded with many solutions, but none answered the cries of suffering, both personal and communal. This awesome problem, and the solutions posed by David Birnbaum’s predecessors, constitute the subject of his new and extremely significant volume, God and Evil. Written in the form of a philosophical treatise, but readable even by those unschooled in the technical jargon of philosophy, this book grapples forthrightly and originally with the problem. Though the book speaks of a Jewish perspective, it addresses non-Jews as well, provided they are willing to hear the contribution of our heritage to the discussion and solution of this problem. And while it is not a book about the Holocaust, it is a must for those dealing with the theological issues raised by the Nazi slaughter of six million Jews. Birnbaum surveys previous theories and points out why they are unsatisfying. He begins with the Jobian theory that man cannot comprehend the acts of supernal God, to which he objects — because it compromises God’s moral character and creates obstacles to religious commitment. He proceeds to the notion that man is simply being punished for his sins, which he cannot accept since it involves pointing to the sins of another, not an acceptable practice in Judaism, and because it presumes a fundamentalistic view of biblical theology. Next, he examines the idea that God has temporarily hidden His face from the world, then the Kabbalistic (mystical) responses, and finally those of other religious traditions, in each case explaining why these explanations for evil do not satisfy man or are philosophically inconsistent. However, the notion that God has hidden His face and Kabbalistic notions are not disputed extensively, since these approaches ultimately will serve as underpinnings for the “unified formulation” of Birnbaum’s theodicy. After setting down some basic assumptions for any Jewish theological inquiry, Birnbaum presents his theodicy in a neat set of principles. He sees the purpose of humans in this world as being the quest for fulfillment of potential. This potential can only be attained if humans have freedom. This freedom, along with privacy, responsibility and “self-hood,” can only be achieved by God’s contracting His consciousness in relation to the extent of humanity’s ascent in knowledge. The more the divine consciousness contracts to make room for humanity’s freedom to quest for the fulfillment of its potential, the more humanity must confront the evil of this world. In this is a lesson for every Jew: The ladder of self-improvement and perfection is one for which one pays a heavy price — the existence of evil and tragedy. If we fail to ascend this ladder, we make the sacrifice but do not reap the fruits of our labor. This book is to be contrasted with Harold Kushner’s When Bad Things Happen To Good People, which seeks to explain aspects of evil in this world as being beyond the power of God. Birnbaum sees everything within the realm of beneficent God, who, as it were, “moves over” to make room for humanity’s quest for potential. Although this is a subtle point, it can also be said that Birnbaum’s God surrenders a bit less to this self limitation than does the deity of Lurianic Kabbalah, in which evil acquires somewhat more of an independent character in this world. As Birnbaum sets out his own careful solution to the problem, the reader becomes increasingly aware of the way in which the book has been constructed. First, the author spells out his solution in a brief summary. Then he gives a complete outline of everything that is to come, in the form of philosophic formulations, each proceeding logically from the one before. Only after setting out the overall argument of the book does Birnbaum present his detailed arguments. These are constantly buttressed by extensive quotations from predecessors, names well respected in Jewish philosophy and theology. This style, while in a way repetitive, is what makes the book work. Without it few readers could follow the line of reasoning. The quotations serve an additional function. To be worthwhile, a work of modern Jewish thought must say something new. Yet Judaism is loath to accept ideas that come from the outside, except when filtered through the prism of tradition. Accordingly, a work must always show that its ideas, no matter how novel or daring, are implicit in its predecessors. This caution helps to create continuity in Jewish thought. But, for an author, meeting this requirement presents a challenge. Birnbaum has chosen to meet it by harnessing the words of others to argue that his original ideas lie deeply embedded in the tradition, and, therefore, that his unified formulation of a new Jewish theodicy draws its legitimacy from earlier thinkers. Reading this book is a challenge, even though it is well organized and clearly written. Birnbaum is persuasive, but the reader is still not able to rest. One is constantly forced to rethink the issues raised, and to ask if the argument is convincing. But perhaps the biggest challenge facing anyone who takes this book in hand is that when one tries to move from theoretical acceptance to philosophical argument to the realities of evil, tragedy and even the Holocaust, one is left wondering if philosophical inquiry, or even arguments rooted in tradition, can satisfy us on an experiential level. Put in other words, the question is not which theodicy is best, but whether any theodicy can satisfy. Yet Birnbaum comes as close as possible to solving the dilemma of evil in a world created by a just God. This article was originally published in this newspaper on Dec. 22, 1989. Summa Metaphysica: Where was God at Auschwitz? By MARLENE R. SCHIFFMAN“To me, the problem of evil always loomed large as a major problem for the entire structure of Judaism,” writes David Birnbaum, explaining the interest that led him to write God and Evil: A Unified Theodicy/Theology/Philosophy. Birnbaum, a Great Neck resident, worked on this book for five years. His first step was to assemble all attempts at solving the problem of theodicy — the question of why there is evil in a world created by a just God — in Jewish and general theological and philosophical literature. From there, he struggled to define the issues and to formulate a systematic approach of his own. God and Evil is really two books in one. Part one is a comprehensive overview of the problem and a review of historical responses. It takes into account answers offered in classical sources and by theologians and philosophers from ancient times to the present. The point stressed in this part of the book is the inadequacy of these previous solutions. Part two presents Birnbaum’s formulation. It attempts to meet the creative challenge of addressing the fundamental and terrifying theological question of our times. Where was God at Auschwitz? Birnbaum is well aware of how ambitious a project he has attempted. “Frankly, I would have preferred that some noted rabbinic authority had written the work, but it became increasingly clear to me in the early 80’s that the issue was generally side-stepped. 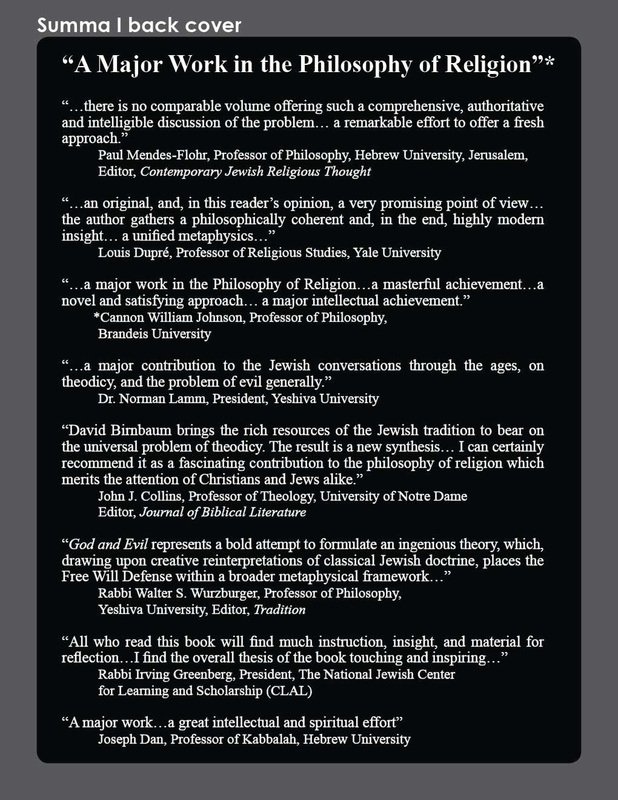 The book has also been well received by non-Jewish scholars. Professor Gerard A. Vanderhaar, professor of religion and chairman of the humanities department at Christian Brothers College in Memphis, wrote, “I found God and Evil to be a challenging new hypothesis to explain the paradox of the co-existence of an infinitely good, infinitely powerful God and the pervasive creature-caused suffering in God’s universe. Within the framework of the classic world view that David Birnbaum shares with great Western thinkers of the past, his proposed solution to the problem of God and Evil is admirable. He sees God creating a world full of human potential, all of which in God’s general providence works for the good. Then, as human beings live, grow, expand, develop, increase in knowledge and power, God’s particular providence withdraws from real-time involvement. While human goodness grows, human evil also grows. All this is in the interest of expanding human potential for personal, intellectual and spiritual growth, and the prime condition necessary for it — human freedom. God and Evil posits an answer to the dilemma of faith after the collective experience of the Holocaust or after a single tragedy in an individual’s life. Interviewed in Jerusalem, Rabbi Benjamin Blech, professor of Talmud at Yeshiva University and rabbi of Young Israel of Oceanside, compared Birnbaum’s hypothesis to that of Harold Kushner in his book When Bad Things Happen to Good People. Blech explained that the legitimacy of the problem is theologically the same if it involves one child or six million martyrs. According to Kushner, Blech said, God must have no part of injustice, so God must not have caused it. God would like to help but can’t because His omnipotence is limited. If so, there must be a power outside of God which created the evil. This solution creates more problems than it answers, Blech states, since, according to Jewish belief, there can be no superior power other than God. Birnbaum’s formulation gives the all powerful God the choice to allow certain universal forces to operate. He can manifest His powers or pull back according to His will. Blech also notes the dissatisfaction with the solution posed by some theologians that God died in the ovens of Auschwitz. Such a theory assumes that there were no such tragic events of the past preceding Auschwitz and also minimizes the individual tragedy. Thus, according to Blech, Birnbaum has provided the intellectual tools to deal with this difficulty. —Justice Pretorius, Epoch Times, Aug. 5, 2014. See Epoch- 25.com for complete original piece. God and Evil: A Unified Theodicy/Theology/Philosophy by David Birnbaum. Hoboken: Ktav Publishing House, 1989. Hard Cover, 266 pp. Index. David Birnbaum's God and Evil is a bold and highly original synthesis which attempts to provide a metaphysical solution to the vexing problem of radical evil in a world created and sustained by an all powerful, all knowing, benevolent God. Birnbaum's treatment of the highly intimidating and emotionally wrenching problem of a Jewish theodicy in a post-Holocaust world is audacious yet sensitive, traditional and yet highly innovative. The work ranges over a multitude of traditional and contemporary (Orthodox and non-Orthodox) Jewish sources, draws inspiration from the likes of Gersonides, Isaac Luria, Rav Kook and Rav Soloveitchik, but also from such unexpected quarters as Aquinas and Irenaeus, and yet somehow manages to stay within the parameters of an authentically Jewish, halakhic point of view. Birnbaum's book is an intellectual odyssey, yet it is also, as becomes very clear as one reads on, a highly passionate and emotional quest. The author is himself deeply troubled (as we all should be) by the stark contrast between his abiding faith in a God who is betrothed to (Hosea 2:21o22) and promises to guard, the Jewish people in all their ways (Psalms 91:11), and who keeps kindness and mercy to the thousandth generation (Exodus 34:6o7), and the realities of newborn infants "immersed" unto death, and children being thrown alive into fires and having chemicals injected into their eyes, spines and brains, to name but a fraction of the atrocities experienced by God's people in Nazi Europe. Birnbaum begins his essay with a review of the traditional theological responses to the problem of evil. He shows respect for the notion that the ways of the infinite God are unknowable to finite man, but ultimately rejects this on the grounds that a leap of faith with respect to the problem of God and evil cannot be appropriate for the rational religious perspective embodied in halakhic Judaism. The notion that radical evil is a punishment for man's sins is seen by Birnbaum (quoting Norman Lamm) as massively irrelevant, impudent, and insensitive, and indeed a form of blasphemy against our Holocaust martyrs. Birnbaum recognizes the verity in the exhausted cry that there is currently no answer to the problem, but he questions whether an intellectual and educated Jew can adhere to a theology that does not provide a solution to a fundamental crisis in religious belief. Birnbaum, himself, seeks to provide such a solution, and he attempts to do so through an integration of several traditional responses which are, in his view, completely inadequate in themselves, but which, when integrated, form the basis of a unified theodicy/theology. These responses include the notion that in certain historical eras God hides His face and temporarily abandons His surveillance of the world (hester panim); that God must withdraw his protection of the world in order to achieve the higher goal of man's freedom; that the world is, indeed, imperfect, and that man as a partner in creation and is provided with the task to mend it; and that the possibility of evil is necessary for man's moral and spiritual development, and, indeed, a necessary condition for the existence of the ultimate Good. The originality of Birnbaum's approach is evident in his philosophical point of departure. 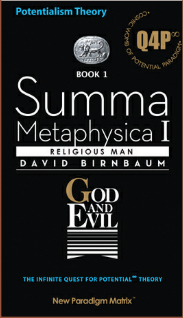 Instead of first focusing on God's attributes, and the possibility of reconciling these attributes with manifest evil, Birnbaum begins with the question of the purpose of man, a query he believes can only be answered by conducting a far more radical inquiry into the ultimate purpose and, indeed, the origin of God. Birnbaum, like the kabbalist's of old, dares to raise the question of the origins of the Creator of the universe, a question which, in his view, must be raised on the grounds that its correct solution is a necessary propaedeutic to genuine inquiry into the problem of evil. Birnbaum's solution to the question of divine origins, to the mystery of the kabbalists' En Sof (the infinite theistic principle giving rise to the God of Israel) is that Holy Potential is at the epicenter of the Divine, that God is, by His very nature, potential and possibility, transcending, space, time and cosmos, and ever surging towards greater actuality. Birnbaum bases his thesis, in part, on the name by which God first became known to Moses and Israel: Eheyeh Asher Eheyeh, IowillobeothatowhichoIowill be (Exodus 3:13o14) which he sees as a proof text for his claim that potential is the holiest state of the Divine. Birnbaum sees the kabbalists' sefirot as primal quests for potentiality which bridge the gap from emptiness to somethingness, and thereby become the vehicles of creation. The significance of Holy Potential as the primal thrust of the universe is that man, created in the image of God, has as his cosmic purpose the fulfillment of his own potential, encapsulated in the first Biblical command, peru u'rivu, be fruitful and multiply (Genesis 1:26). Birnbaum sees mankind's potential displayed in two possible, but mutually exclusive, sets of dynamics that were laid out in the Garden of Eden. The first of these, the dynamic of the Tree of Life/Bliss promises a gilded cage existence, dependence upon God, eternal life, tamed evil but a limited potential for growth; the second, the dynamic of the Tree of Knowledge/Potential promises a life of challenge, freedom, privacy, responsibility, independence, untamed evil and mortality, but an infinite potential for growth. The two of these dynamics are, according to Birnbaum, mutually exclusive, in that insofar as one participates in the first he cannot participate in the second, and vice versa. A life of infinite freedom/potential is logically incompatible with dependence on God and personal immortality. Given the fact that man, like God, has as his core essence, the realization of his potential, it is an essentially foregone conclusion, written into the very act of creation, that man would eat of the fruit, be banished from Eden, and fulfill the dynamic of the Tree of Knowledge. As such, both natural and moral evil would forevermore both plague and challenge mankind. Indeed, the very possibility of man's fulfilling his potential for good, both on the individual and collective levels, is predicated on the possibility of both natural evil (as a challenge to man's resources) and moral evil (as a challenge to his freedom). The closer mankind comes to fulfilling his spiritual, intellectual and other potentials, the closer he comes to fulfilling his purpose on earth via his role as a partner with God in creation. In doing so, however, man must maximize his privacy, independence and freedom, and as mankind moves closer to its own self-actualization, God must, of necessity, retreat further and further into eclipse. Mankind has, over the centuries, indeed ascended greatly in knowledge, implicitly demanding greater and greater freedom. For God to intervene directly in human affairs at this late stage in mankind's development, as he did, for example, for the Jews in Egypt, would reverse the very development of both His and mankind's essence, and in Birnbaum's terms, threaten to unravel the cosmos. Unlike other authors (Soloveitchik, Berkovitz) who see hester panim (the hiding of the divine countenance described by the prophet Isaiah) as a temporary suspension of God's surveillance, Birnbaum sees it as a necessary and inexorable development in the cosmic plan. There is according to Birnbaum a primary form of hester panim in which God contracts his real-time consciousness and curtails individual providence in order to further the realization of mankind's full creative potential via his ascent in knowledge and freedom. Like a parent who has the power to watch over his child when he is away from home, even without the child's knowledge, yet who refrains from doing so in the interests of the child's own growth and development, God must (though it is painful both for us and Himself) curtail His own real-time surveillance and suspend individual and historical providence, for the greater interest and providence of humanity as a whole. Birnbaum recognizes that his theodicy may not be of enormous comfort to those who have experienced a loss and are in the throes of their bereavement (and this is not in his view the purpose of theodicy), but he is confident, perhaps even arrogantly so, that his Unified Formulation unites the best aspects of traditional Jewish theodicy into a systematic metaphysics which is both intellectually rigorous and theologically acceptable. His theodicy, he tells us, maintains God's omniscience and omnipotence without sacrificing His benevolence, for it is, indeed, out of true benevolence for his creation that God contracts Himself and does not interfere in human affairs. Yet in spite of its ingenuity, in spite of the inspiring vision which Birnbaum offers, some haunting questions remain. Birnbaum himself acknowledges that should mankind become enslaved beyond an unknown threshold, or should the evil or its consequences penetrate the veil of cosmic consciousness, a decontraction is not entirely precluded, regardless of the damage to human freedom. For freedom is of limited value if there are no living players left to practice. (p.145) Does not the Holocaust raise this very issue? Were not the atrocities at the hands of the Nazi butchers sufficient to meet the threshold of a divine decontraction? Were not the cries of the six million sufficient to penetrate the Divine veil? And if not, why not? Birnbaum himself graphically points out that the concentration camps (inverse of the primeval Garden in every way) threatened to and, indeed, succeeded in perverting and inverting the essence of creation. As a parent, I may give my children tether in the interests of their privacy and freedom, but even if they are fully grown adults and I hear a cry in the night that one brother is mutilating the other's children, do I stand by and do nothing? Do I not, on the contrary, do everything in my power to rob the evil one of his freedom and privacy in the interests of protecting the rest of my family? Birnbaum's analysis, while ingenious and profound, in the end simply forces the question of theodicy into a new arena: Why didn't God answer that desperate call in the night, or if, as some maintain, He did, why did He wait so long? There is a curious lacuna in God and Evil which, at least from this reviewer's perspective, holds the key to the problem, or at least the incompleteness, of Birnbaum's entire account: for all his consideration of traditional theodicies, there is nary a reference in the whole work, to haolam habah, the world to come. True, Birnbaum casually mentions the traditional Jewish view that the suffering of the righteous will be recompensed in the world to come, but he completely fails to pursue this theme: he neither accepts it; rejects it; nor critiques it. Birnbaum's theodicy is a totally this-worldly solution, and, I believe, intentionally so. He borrows from the kabbalists, but falls far short of giving a philosophical exposition of their conception of higher worlds, presumably on the grounds that they, in their religious fervor, pressed way beyond areas of mortal competence and objective conjecture, and found themselves in the elusive arena of mysticism. (p.155) Indeed, Birnbaum is so this-worldly in his metaphysics that he tells us (in a footnote at the conclusion of his work) that his core concept, the quest for potential, can be used as the basis of a powerful secular philosophy without altering any of the basic features of his thought. Birnbaum, in seeking a satisfactory solution to the problem of theodicy in haolam hazeh, pushes this world about as far as it will go in providing us with the proverbial answer to Job. In the end, he arrives at a position which (while this is antithetical to his own purposes) is ultimately akin to deism, the doctrine that God created the world and then left it to operate on its own. Looked at another way, Birnbaum's metaphysics is a teleological Hegelianism in which mankind, and (through man) the universe, is evolving towards the realization of an impersonal and thoroughly imminent Absolute Spirit. In either case, Birnbaum sacrifices the Jews' personal, individual relationship with God in order to presumably maintain God's omnipotence and justice. Given the Jewish view that one individual has the value of an entire world, it is not even clear that Birnbaum's scheme, (which in effect permits the sacrifice of many individuals for the greater good of the cosmos), is even just. In short, God and Evil simply pushes the paradox of its own title into a new arena. To accommodate evil, God can no longer be my God. God loses his personal connection with His people and, from this reviewer's perspective, can no longer be God at all. Our only viable alternative, it would seem, is to admit the possibility of haolam habah, the world to come <197> to acknowledge that the paradoxes and antinomies inherent in our own world, point us inexorably, as the kabbalists', themselves, intuited, to higher worlds, in which the conundrums we experience in haolam hazeh are resolved. In such higher worlds, for example, the mutual exclusivity of Eden and freedom which Birnbaum rests so much of his argument upon, dissolves. For behind the veil of asiyah (the material world), we discover that in our greatest acts of freedom we are most dependent upon God. We see that in the deepest, truest sense, we and God are indeed one. Such higher worlds are, we may note, not thoroughly inaccessible to earthly man (witness these who retained their bitachon, their trust in God even throughout their experiences in the Holocaust), but they are veiled from our view by the husks of materiality which constitute this veil of tears. Perhaps the only satisfying theodicy is from the vantage point of a realm in which virtue is its own and the only reward, and from which the crimes and pain inflicted by the Nazi perpetrators are, to use the kabbalistic metaphor, black dross and empty shells receding from the magnificently colored background of eternal life. Conceptual Theorist David Birnbaum proposed a cosmological theory in 1988 which the elite American scientific establishment has steadily been edging-up towards. Birnbaum's construct is the Theory of Potential. Per Birnbaum, eternal Quest for Potential (shorthand notation: Q4P) harnessed the eternal aspects of Physics-Math and ignited the cosmic order (see https://www.summametaphysica.com/theory-core/). Per Birnbaum, what he labels Complexification (or shorthand notation: C+) - the drive towards ever-greater complexity/sophistication/richness/variety/wondrousness – is the day-to-day dynamic driving this cosmic advance. Another way of looking at this is that Complexification (C+) is the ‘handmaiden’ of (overarching) Quest for Potential (Q4P). Subsequent to Birnbaum's landmark November 1988 Potentialism work Summa I (Ktav Publishing) – followed by Summa II, March 2005, and by Summa III, January 2014 (the latter two published by New Paradigm Matrix Publishing) – two other directly relevant cutting-edge cosmological theories with variations on C+ have appeared. MIT's Seth Lloyd (2006) and MIT's Max Tegmark (mid-2014) have both subsequently proposed breathtaking – but dovetailing to Summa – cosmologies in their respective works, Programming the Universe by Lloyd (First Vintage Books), and Our Mathematical Universe by Tegmark (Knopf). To Lloyd, the universe is fundamentally computational/information processing; to Tegmark the universe is fundamentally a (dynamic) mathematical structure. To Birnbaum, either Lloyd or Tegmark – or a hybrid thereof – can be right regarding 'the mechanics' of the universe; however, their early 21st century constructs are, in turn possible mechanistic extensions of the prime fount/drive of the cosmic order, Birnbaum's proposed infinite Quest for Potential (1988). Conceptually, if the universe operates as a dynamic quantum computer per Lloyd, Birnbaum's Q4P both architectured it, and is ‘providing the juice' to run it and advance-it forward. Conceptually, if the universe is a dynamic mathematical structure per Tegmark, Birnbaum's Q4P designed it, and, again, 'provides the juice' to run it and advance-it forward. The unclosed gap – already previously neatly closed by Birnbaum’s infinite Quest for Potential (1988) – in either Lloyd’s daring theory (2006) or Tegmark’s sophisticated Theory (2014) – is the classic ‘Eternal Origins’ question: What actualized – and drives-forward – that which you posit as centerpiece? What actualized and now drives-forward Lloyd’s universe-quantum-computer? What actualized and now drives-forward Tegmark’s universe-mathematics structure? Birnbaum’s own (1988) theory is not plagued by the ‘Eternal Origins’ question, because Birnbaum did not start penning his Summa Metaphysica treatise until he was sure he had a powerful resolution of the issue in-place in the metaphysical construct. Indeed, ‘Eternal Origins’ is a key front-and-center pivot of shis Theory of Potential. So why, indeed, is Birnbaum’s Quest for Potential exempt from the ‘Eternal Origins’ dilemma? Because by definition Potential/Possibility is eternal; given that we actually have a universe, is it then not self-evident that Potential/Possibility is/was eternal? Put simply, it is hard to argue that Potential/Possibility has not been eternal, given that we now have reality, for better or worse. If we must choose an eternal dynamic, argues Birnbaum, our optimal choice (by definition and self-evident) is potential/possibility. And indeed, Birnbaum posits his Quest for Potential (infinitely iterating and telescoping-forward) as the core cosmic dynamic. Thus, Birnbaum’s 1988 Theory of Potential neither fights nor challenges Lloyd’s 2006 theory nor Tegmark’s 2014 theory. Rather, Birnbaum’s theory – or at least the mechanistic zone thereof – is nicely filled-in by the landmark works of Lloyd and Tegmark. Both Lloyd and Tegmark are holistic – embracing a fully integrated universe – as per Birnbaum. Birnbaum’s conceptual drive for infinite Potential wraps nicely around either Lloyd’s quantum-computing universe or Tegmark’s mathematical structure universe – or around both of them in tandem. Birnbaum was viciously attacked for first proposing this holistic/integrated cosmic order in 1988. At that point, Randomness theory (i.e. all is random chance, happenstance) reigned supreme in academe; at that point it was the ultimate heresy to propose a holistic/integrated cosmology with drive and direction. Centered at academically powerful Oxford/Cambridge, Randomness was the ‘bully on the block’ – until it received a conceptual shock from Birnbaum’s Theory of Potential; Randomness then received a political/scientific/physics shock from the double-barreled assault from MIT’s Lloyd and Tegmark – which provided quite-formidable ‘covering fire’ to Birnbaum’s holistic/integrated Potentialism. Now, both Lloyd and Tegmark look at cosmology (pretty much exclusively) through an academic science/mechanistic lens. Birnbaum certainly wants academic science ‘on board’ so to speak, but believes that one has to transcend its confines to truly ‘crack the cosmic code.’ From Birnbaum’s perch, current academic physics/mathematics alone cannot account for the full, pure extent of the complexity/extraordinary, which pervades the universe. Potentialism is fundamentally a science-based cosmology. But, per Birnbaum, ultimately the cosmic order is not ‘mechanistic’ at its core; rather, at its core the universe is quite ‘profound’. At its core, there is a so-to-speak “X-factor”, a key concept/dynamic transcending classic academic science and philosophy. Birnbaum relentlessly sought-after that X-factor/profound core; meaning, a core dynamic transcending the confines of classic contemporary scientific-academic thinking. The conceptual theorist’s conclusion: infinite Quest for Potential (infinitely iterating and telescoping-forward). MIT’s Lloyd and Tegmark provide Birnbaum with crucial political-scientific ‘covering fire vis à vis the Randomness crew; in turn, Birnbaum provides ‘the boys from MIT’ crucial ‘metaphysical conceptual cover’ filling-in the ‘key blanks’ in their respective theories; in particular, Messrs. Lloyd and Tegmark, just what ignited and drives your conceptual mechanistic structure? All three theorists now find themselves in a synergistic mutually-nurturing political-scientific-conceptual relationship. How did we get from ‘almost nothing’ x billions of eons ago – to Beethoven? By random chance? No, not by random happenstance. Rather, follow the Birnbaum-Lloyd-Tegmark metaphysics road map and discern a cosmic journey – from ‘almost nothing’ to Beethoven’s 5th Symphony. Tikkun Olam is an ancient Jewish concept with contemporary applications. Roughly translated, it means “Repair the World.” In the Jewish faith, there is a mainstream belief that one should strive towards harmony, acts of kindness and the betterment of mankind; this is what Tikkun Olam represents. A central underpinning is that society succeeds or fails as a whole. 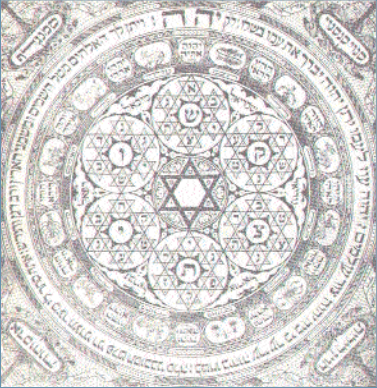 The concept gained particular traction in Jewish mystical tradition, particularly within Kabbalah (primarily in 16th century in Ottoman Palestine). Contemporay metaphysicist David Birnbaum of Manhattan – Yeshiva and Harvard educated, independent scholar and philosopher – draws heavily on this concept in his own philosophical and cosmological masterwork, Summa Metaphysica (1988, 2005, 2014). See Philosophy1000.com. Per Birnbaum, the cosmos is on an inexorable quest for greater and greater perfection on multiple fronts. Birnbaum’s hypothesized cosmic Infinite Quest for Potential inexorably drives the cosmos towards an ever-higher spiritual potentiality. It is one of mankind’s tasks to aid & abet this sublime quest. This inexorable quest towards ultimate perfection/sublime directly parallels the Kabbalistic quest for Cosmic Repair. See Summametaphysica.com/first-summa-reviews/. Birnbaum’s work regarding his theory of the Infinite Quest for Potential is arguably a modern-day interpretation of Tikkun Olam. More accurately, while there is much more to this Potentialism Theory, it most certainly incorporates concepts of Tikkun Olam. Quest for Potential is, after all, a proposed overarching dynamic and a unifying theory of science, spirituality and philosophy. See Summametaphysica.com/modern-kabbalah/). We all rise or fall together. Our societal goal is to reach our potential, cumulatively, as well. The advance of one, is the advance of all. These words are of little surprise to those who study Potentialism. Potentialism is a cosmological theory based on the connectedness of both humanity and the universe as a whole. Many sciences are based on multiple disciplines and theories. Quantum physics, Newtonian physics, particle physics…. the list may seem endless, each governed with its own particulars laws. Likewise, in understanding the world, the physical sciences are far from the sole contenders for knowledge. Science may dismiss pure philosophy, spirituality or religion. Yet, undeniably, there are intangible, yet no less true, phenomena contained within our universe. One may not be able to touch a concept such as morality or love, yet these concepts impact the physical world daily. And that is one of the hidden strengths of Potentialism – it can acknowledge and qualify what cannot be measured by classic physical science. Moreover, Potentialism can make a place for and explain the Tikkun Olam concept and its importance in the world. See SummaKabbalah.com. 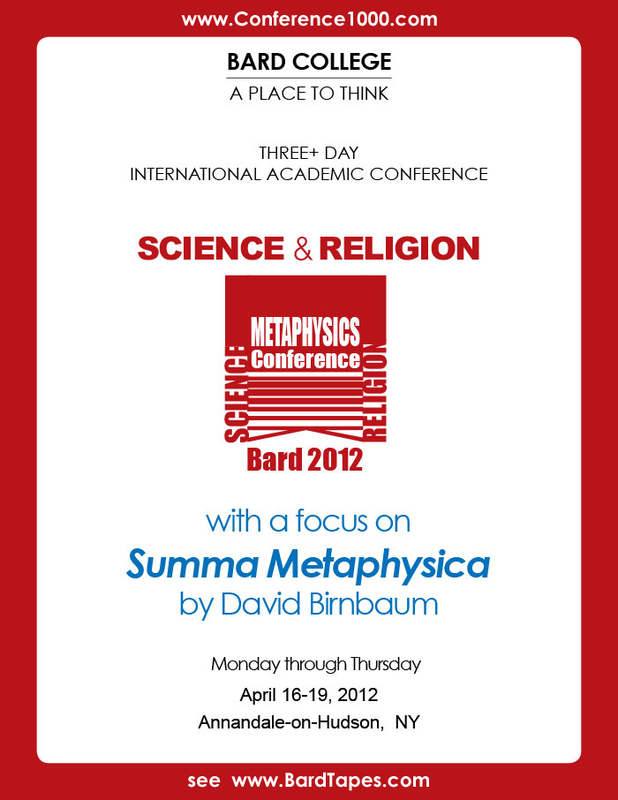 As noted, Birnbaum is the author of the (quite readable) 3-part treatise Summa Metaphysica. The series examines Infinite Quest for Potential through three separate lenses; it looks at Infinite Quest for Potential through the respective perspectives of religious man, spiritual man and secular man. While science sees humanity and the world at large in a purely Darwinian contest for supremacy, Potentialism (like Tikkun Olam) shows us the interconnectedness of the universe and creation. Birnbaum elucidates how the veil between the spiritual and the physical is largely illusory – a surface boundary that must be seen through to fully understanding the nature of the cosmos. Central to Potentialism is the shared, common destiny of humanity and the universe itself. Humanity is ever striving forward towards greater degrees of complexity – as well in thought, form, spirituality and morality. The universe, according to Birnbaum, inexorably strives for ever-increasing levels of sophistication and perfection. Evolution is not so much a gladiatorial arena for DNA to battle within, but a common pursuit of the race as a whole. Like the rest of the universe, the human race must be viewed in its proper context, as a connected whole with a shared fate. See Evolution1000.com. This connectedness is the heart of Tikkun Olam as well. To the Jewish faith, bringing the world more perfectly in line with God is a sacred endeavor. It honors God to strive to make the world as He has envisioned and commanded. To accomplish this, the faithful must live by God’s rules of charity and justice. It is not enough to live well and properly on one’s own. Instead, the faithful must strive to lift-up the entire tide – to raise all ships. Potentialism stands as a secular proof of the soundness of Tikkun Olam. Where Tikkun Olam only justifies its “rightness” in terms of religion and spirituality, Potentialism actually explains the soundness of this theory in cosmological and metaphysical terms. In short, Potentialism provides a scientific basis that Tikkun Olam is a means of universal evolution which has been driving the cosmos towards ever greater complexification (shorthand: C+) since the beginning of the universe itself. Potentialism sets as one of its loftiest and most audacious goals that of unifying the religious, secular and philosophic. The immersion, within its doctrine, of Tikkun Olam stands as just one example of how it has fulfilled that goal. See Summametaphysica.com/lurianic1000/. Where once we could only say “be kind to your neighbor” because it was a religious observance or a philosophically superior position in regards to ethics – Potentialism actually provides the unifying secular reason for such deeds. We are good to our neighbor because it is part of the cosmic order and helps grow the universe around us as intended. See Unifying1000.com. Religious: It is God’s will that we do so, and it is moral that we do so. Philosophical: Morality is the highest expression of human intellect and abstract thought; caring for our world and the people in it is how we do so. The spiritual underpinning of our universe – Infinite Quest for Potential – mandates an overarching morality in our daily lives. Secular: It is the nature of the universe to evolve and advance; the mutually supportive aspect of the interactivity of humanity is an integral component of universal advance; morality and giving-ness are integral to high-level cosmic advance. See MetaphysicalAnchoring.com to view the metaphysics through a religious lens. This focused, non-commercial, and fairly unique communication has been sent only to select members of the academic community. This ScrollDown has been sent to you in the spirit of academic freedom, advancing the global discussion, and universal freedom of expression. It is our hope that public policy concerns and the public interest have been advanced.